A spacious and grand classic old Krakow apartment with a remarkable Bohemian interior. 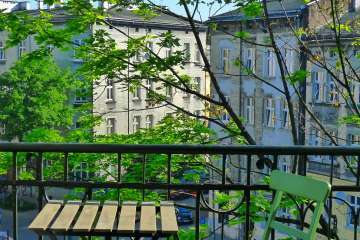 Perfectly placed between the Old Town and Kazimierz Jewish Quarter with everywhere you'll want to see easily walkable. Two balconies, high ceilings, a 43m2 salon, this is the former home of Greg, utt's founder. We've scraped back years of modern decoration to create a unique 'modern rustic' Bohemian interior scheme that we hope you'll love. Wall murals by young Polish artist Arek Twardowski, and a mix of antique and specially commissioned furnishings (beds, sofas). The apartment is 92m2 and has balconies front and back. 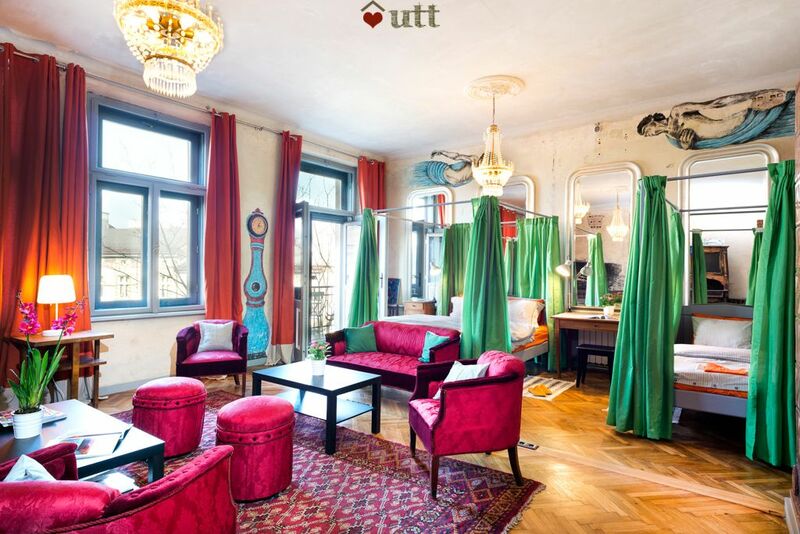 It's one of the large apartments built for wealthy businessmen in 1905 in the Viennese Secessionist style, on the Kazimierz edge of the Old Town. 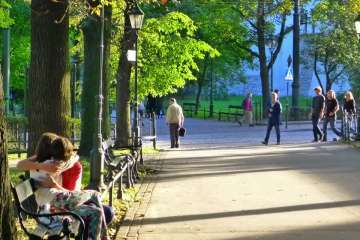 Today that means it has an ideal location between the touristy Old Town and the Kazimier 'Old Jewish quarter' where you'll find the best bars and restaurants in Krakow. 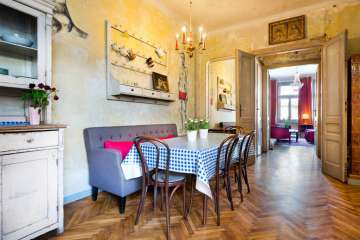 It sits overlooking a quiete square with the best patisserie in Krakow on the ground floor, an art gallery next door and other art galleries and antique shops on the square. You'll find very good food at great prices a short walk in every direction. This is why we love Krakow. The apartment is on the top, 3rd floor and has high ceilings throughout, plenty of light and space. Guests might like to consider a two centre holiday - here, and also down to our log mountain house about 80 mins drive away - great for winter skiing and summer hiking. 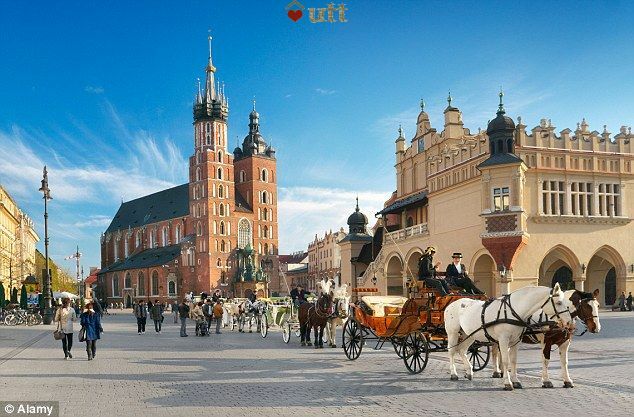 Krakow airport is served by many carriers including Ryanair, LOT, Easyjet, and Fly-Be - just 25 minutes by taxi or train into the centre of town - a choice of 13 UK and Irish airports will land you directly in Krakow! 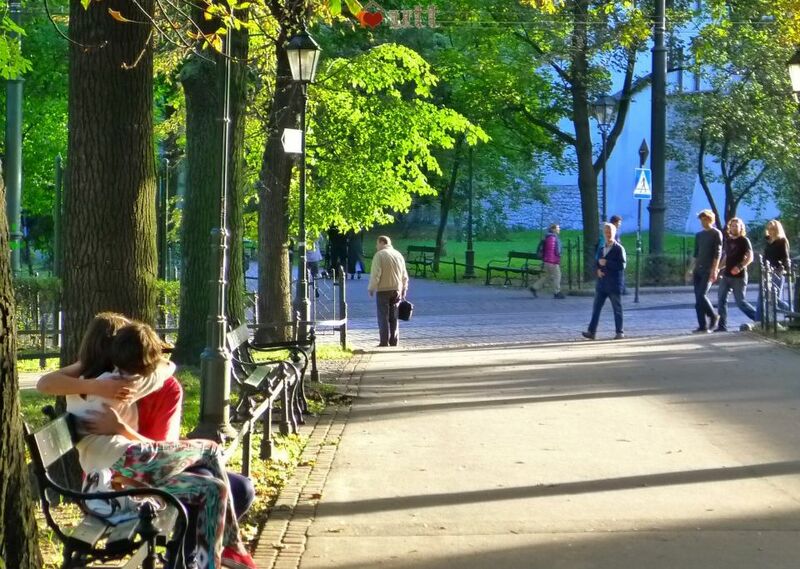 Katowice airport is served by many carriers including Ryanair & Wizzair - 1 hr 10 mins by direct bus from airport to centre of Old Town - a choice of 8 UK & Irish airports will land you in Katowice! If you choose to drive from the UK you'll be rewarded by an amazing roadtrip. 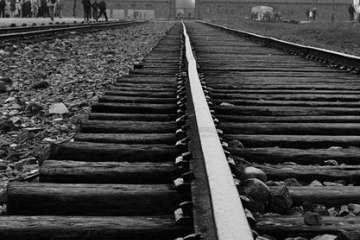 Or travel to Krakow from the UK by train. 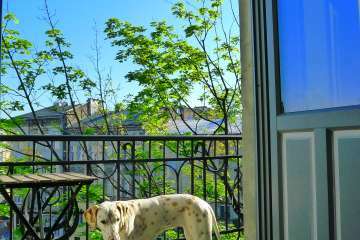 The apartment is centrally heated and has been completely renovated ready for 2015. A connection to WIFI has been booked for 7 April 2015. 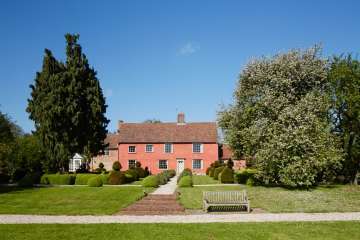 All windows have been carefully quadruple glazed to retain the original casements and have triple glazing added. Salon - a huge, bright room some 43m2 with balcony off that overlooks the square. This room is bigger than many apartments. 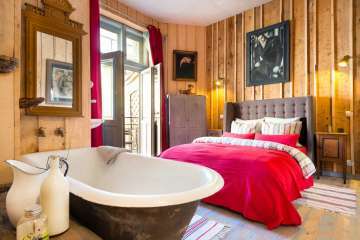 It has one Kingsize fourposter bed, one large single (90cm mattress - so adult size), two sofas and four armchairs. It can easily seat 10 people in comfort. Murals by celebrated Polish artist Arek Twardowski. 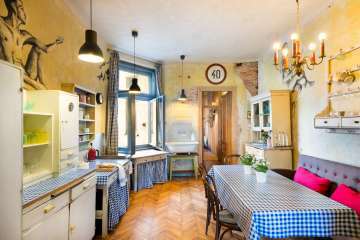 Kitchen - fully equipped with oven, fridge-freezer and 1905 & 1950s kitchen units. 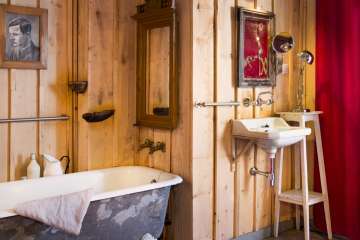 The sink is original to the flat from 1905. Large dining table for 8. Murals by celebrated Polish artist Arek Twardowski. 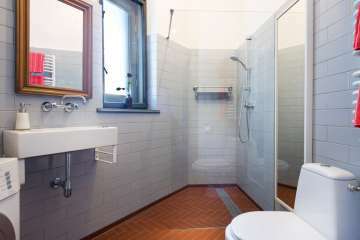 Wetroom - a good-sized wetroom with large shower and toilet. Hairdryer and iron. Washing machine. 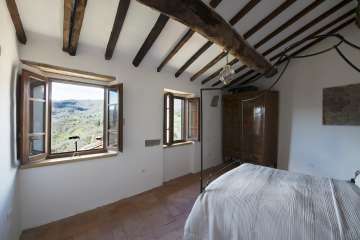 Bedroom - with large rear balcomy off. Newly lined with antique wood (insulation behind), an antique bath, a 1930s handbasin, and original art (as throughout the flat). Parking - available on street below, metered Mon>Fri 10.00>20.00 (currently 3 PLN an hour) or you can park over the river (free) and walk back. Note unless you need to bring your car you 'll have no need for a car this central in Krakow. WIFI - no charge (Broadband). There is a hairdryer, and there is an iron. Museums - for modern art, C19 art, national collections, ethnography, natural history - there must be around 100 museums! Zawoja, Babia Gora National Park, Southern Poland.. The Artist Apartment is wonderfully wacky, we loved it, although it did add to my step goal for the day, climbing to the third floor. Having two balconies meant we could feel part of the city at the front of the building and have the privacy of the back of the building. It was quiet and kept cool during the hot days, which was very welcome. 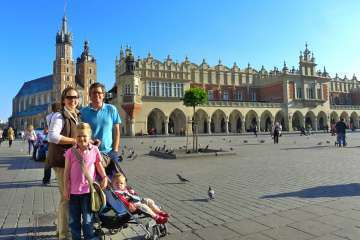 Krakow is a lovely city and the authenticity of the apartment made our stay a real hit with all the family. Do go you will love it!! 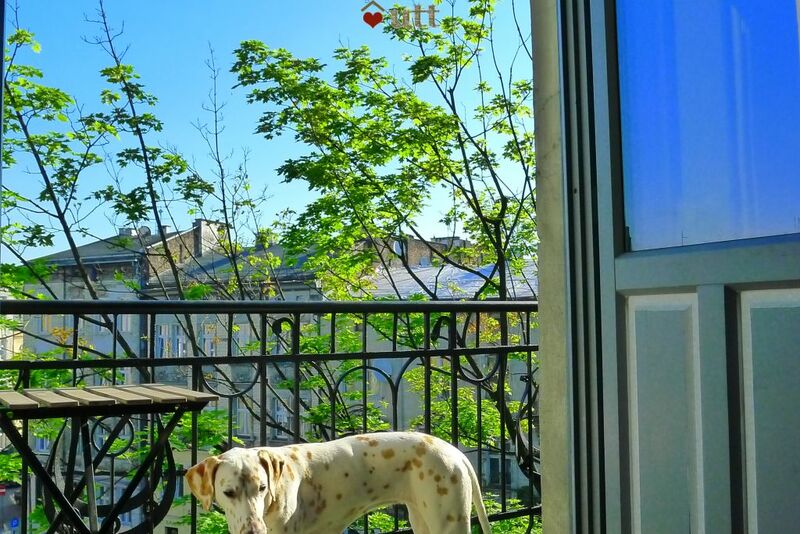 The apartment is beautiful and in such a great location - quiet but close to everything. 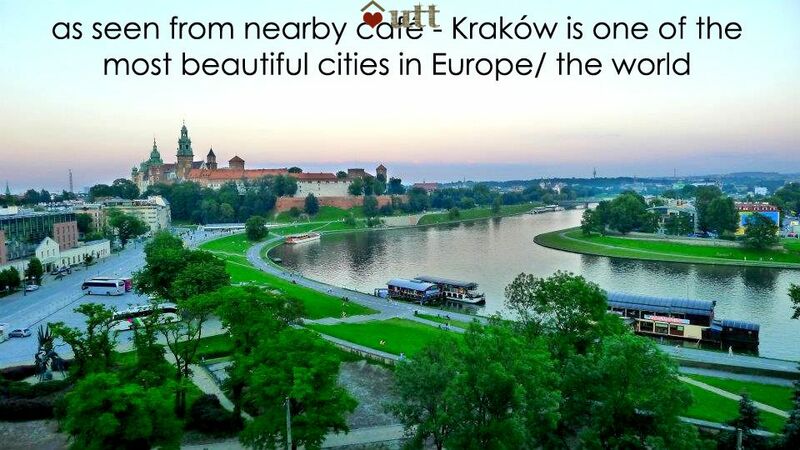 Kraków is one of our favourite places and this is a wonderful place to stay and see it! We certainly enjoyed every moment in this apartment. The apartment feels so unique...and unlike anything we ave ever experienced. We might meet again! Best wishes from Venhuizen, Holland! Great apartment. Great locality. Great city. Krarow is a beautiful and fascinating city. We loved staying in the Jewish quarter. It is vibrant and quirky just like the apartment. We were slightly taken aback when we first saw the interior of the apartment despite having seen photographs online. We expected different but the paintings are much more prominent than you initially expect. Having said that the apartment grows on you and we were delighted to be staying somewhere with real character and soul. The whole area oozes history and stories and that atmosphere is wonderfully carried through into the apartment. 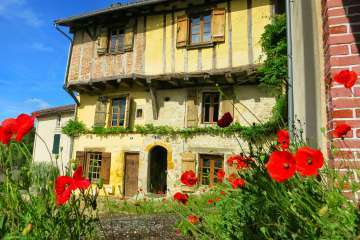 It is a wonderful place to stay. 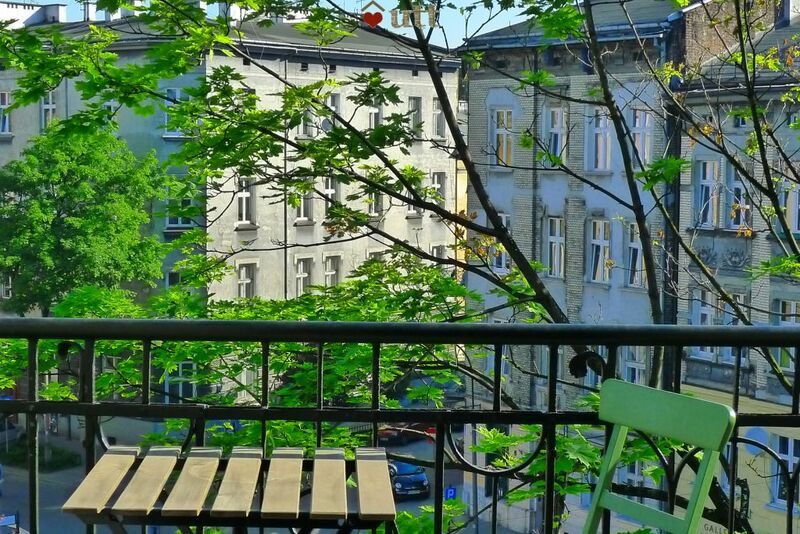 Absolutely loved the apartment, the setting and the entire time we were in Poland. Beautiful - thank you - diolch! 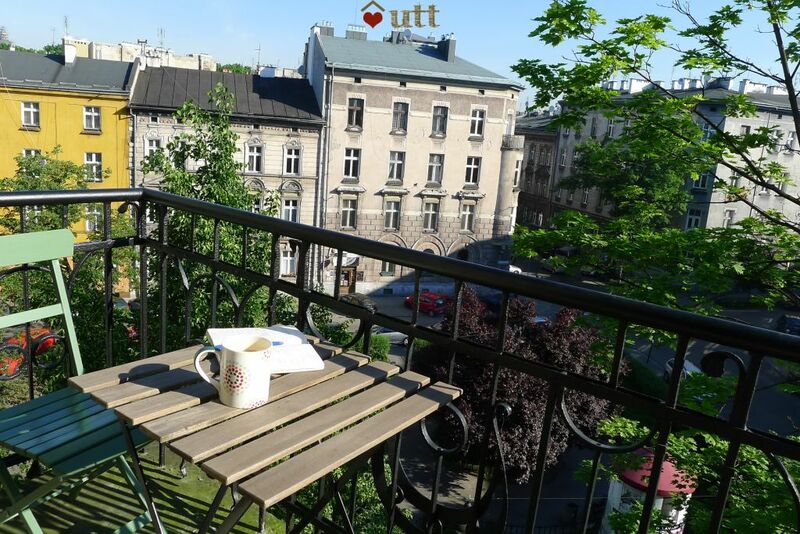 This was an amazing place to stay in Krakow - perfect location and stunning apartment. Eating out in Krakow was such good value we never actually used the kitchen. We had a very happy four nights here, the area is packed with lovely restaurants, bars and cafes and we enjoyed a bike tour and "communism tour" in trabants. A taxi from the airport was v reasonable. We combined this with two nights at Sucha Gora - highly recommended! 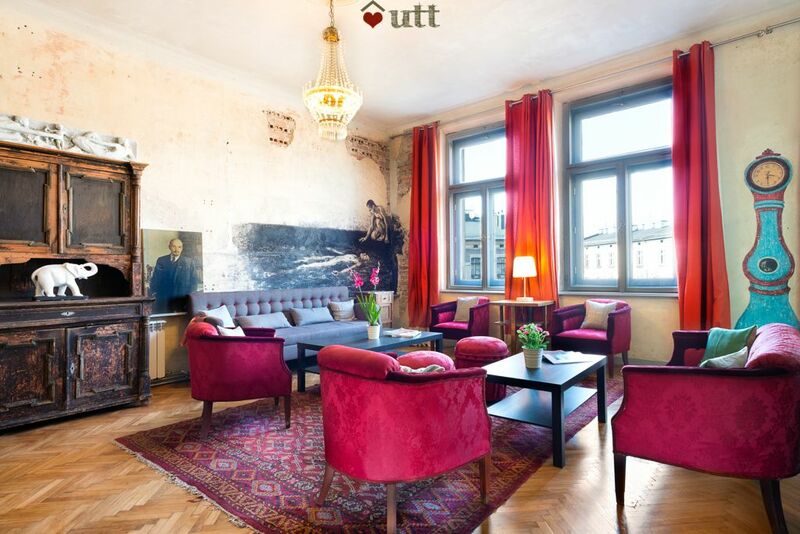 Stunning apartment in a fabulous location. Highly recommended! Place was absolutely amazing. Lovely inside and close to everything in Jewish Quarter. I would 100% recommend this place if you are going on holiday in Krakow. Owner is also a gentleman and always willing to help with any query you have. Will definitely stay here when back in Krakow again. Thanks! We loved Kraków and adored staying at the flat - the size and location were fantastic. When we stayed, the weather was initially very hot, so we were glad that a fan was supplied. We mainly ate out but it was useful to find the little 24/7 shop on the corner, which supplied everything. (I wasn't sure how to use the oven though - maybe some instructions?) The shower room was fantastic and I also enjoyed a few dunks in the roll top bath. 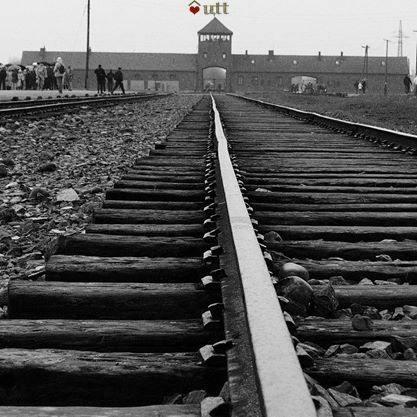 We appreciated the holiday literature in the kitchen, and used it to book trips to Auschwitz/Birkenau and to Wieliczka. The WIFI was highly useful in planning for weather, outings, and getting extra information. It was a great week for exploring and relaxing.